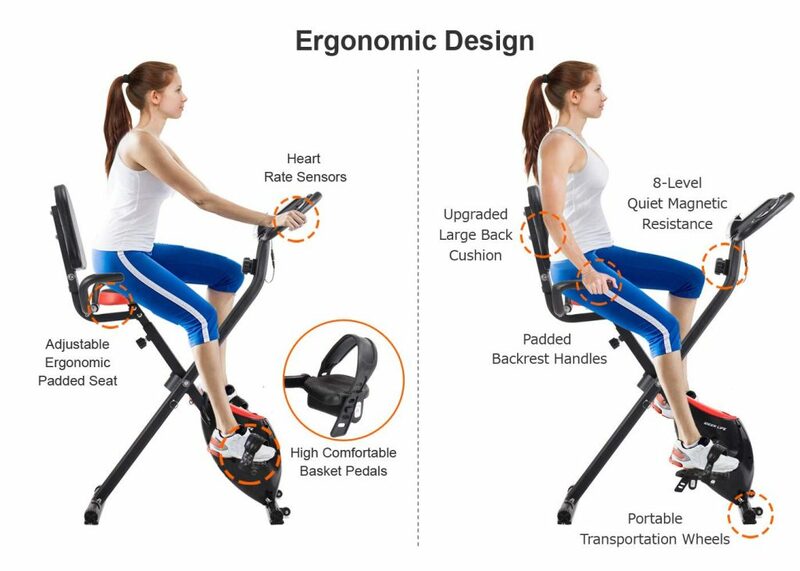 IDEER 09027 and 09028 are upright exercise bikes with magnetic resistance and convenient foldable design. The average satisfaction score on Amazon.com is 4.6 out of 5 stars by 11 customers as of today. You have two color options of black 09027 and silver 09028, both of which look pretty and have the same price tag. The magnetic resistance can be adjusted to 8 different levels via the resistance knob in the middle for easier or more difficult workout. You should change the resistance level during your workout to allow more efficient calorie burning. You can keep an eye on your current heart rate on the multifunctional LCD-backlit display panel and stay in your optimal zone for burning more calories and fat. You’ll also find the other usual indicators of distance, calories burnt, time, speed, odometer and scan that switches between each indicator automatically. There is a convenient phone/tablet holder to help keep you entertained and distracted to exercise longer and burn more calories. It has a heavy duty steel frame despite being compact and foldable and carry a maximum user weight of 242.5 pounds or 110kg. It weighs 37.9 pounds and measures 26.4 x 44.5 x 15.9 inches as assembled and 10.6 x 52.8 x 15.9 inches as folded. The small 3.53 lb. heavy duty quiet flywheel ensures smooth operation and stability. The Ideer Foldable Bike is designed for daily cardiovascular or aerobic workout at home or in the office, but not in commercial gyms. You can just fold it and roll it away easily on its transport wheels, which makes it ideal for small flats. There won’t be any need for heavy lifting and no strain on your back or arms. You can burn calories and fat, gain stamina and endurance and enhance your overall health in the comfort of your home. This magnetic bike doesn’t require any maintenance to run efficiently all the time. You can work out whenever you want, even in the middle of the night or early in the morning without disturbing anyone in your house. It has a large, ergonomic and comfortable PU leather padded seat with an upgraded large foam padded back cushion for your comfort and relaxation during your workout. You can adjust the seat for height to accommodate different users- shorter or taller. The two basket pedals have the non-slip surfaces and include solid adjustable straps for keeping your feet secure. Your feet will not easily slip during your session. It is easy to put together with the tools and assembly instructions included in the package. 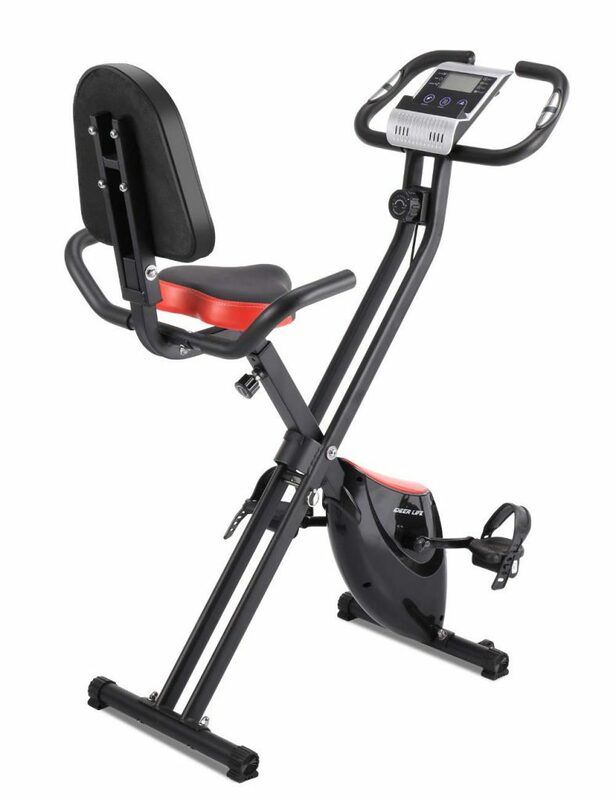 If you go to gym just for doing cardio workout, you can save quite a bit of money by investing on this home bike that you can use throughout the day, when you’re watching TV or listening to music. People at different fitness levels can use it for different purposes, including a warm-up before a resistance training session. For those with knee issues this bike is easy to mount and dismount. Benefits include losing weight and staying in shape by burning unwanted calories and fat, building lower body muscles, boosting energy levels and productivity, reducing cellulite, reducing your daily stress and relaxing, enhancing blood circulation and improving your overall health- body and mind. If you are an advanced trainer or a high performance athlete the high resistance levels may not feel that high for you, but it will still give you a decent workout. There is no extra bells and whistles on this model with a basic design but it does the job well. Overall it offers great value for money.